AFC Rushden & Diamonds get their pre-season friendly programme under way at Rushden & Higham United tomorrow (Saturday). 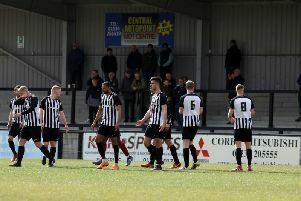 The match at Hayden Road, which is for the Chris Ruff Memorial Cup, signals the start of a busy line-up of friendlies as Diamonds prepare for their Evo-Stik Southern League Division One Central campaign. And, after their early work on the training ground, boss Peaks is looking forward to a match situation. “We will have had five sessions by the time we get out there and I think the boys will be ready for it,” he said. “I think all players prefer to be playing matches rather than training, that was certainly the way I felt about it during pre-season. “And I think, as a manager, you learn more from seeing these lads in a match situation. Diamonds completed the signing of Jason Kilbride last weekend but that was followed by the news that Adam Confue and Declan Rogers had both left the club. But Peaks added: “To be honest, at this stage, you always have comings and goings and Declan deciding to leave wasn’t completely unexpected because he wants to be at a club closer to home. “The same applies to Adam going back to Daventry, it wasn’t unexpected.